About 355,000 million gallons per day (Mgal/d) of water was withdrawn for use in the United States during 2010, a decline of 13 percent from 2005 and a substantial change from the level of about 400,000 Mgal/d reported from 1985 to 2005. Withdrawals for 2010 were lower than withdrawals estimated for 1970. Fresh surface-water withdrawals (230,000 Mgal/d) were almost 15 percent less than in 2005, and fresh groundwater withdrawals (76,000 Mgal/day) were about 4 percent less than in 2005. Saline surface-water withdrawals were 45,000 Mgal/d, or 24 percent less than in 2005, and saline groundwater withdrawals in 2010, mostly used for mining, were 3,290 Mgal/d. As in 2005, water withdrawals in four States—California, Texas, Idaho, and Florida—accounted for more than one-quarter of all fresh and saline water withdrawn in the United States in 2010. California accounted for 11 percent of the total withdrawals nationwide and 10 percent of the total freshwater withdrawals. More than 60 percent of California’s withdrawals were for irrigation, and 17 percent, almost exclusively saline water, was for thermoelectric power. In Texas, about 45 percent of withdrawals were for thermoelectric power, and 28 percent was for irrigation. Irrigation accounted for 81 percent of water withdrawn in Idaho, and thermoelectric power accounted for 61 percent of water withdrawn in Florida. 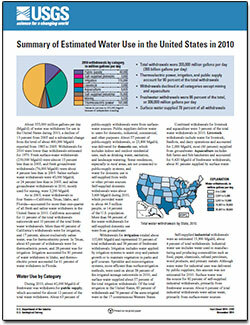 Barber, N.L., 2014, Summary of estimated water use in the United States in 2010: U.S. Geological Survey Fact Sheet 2014–3109, 2 p., https://dx.doi.org/10.3133/fs20143109.